Today we’re going to talk about how to set the right kind of goals so that you’re constantly moving your business forward towards greater and greater success and the technique for doing that is called the SMART goals technique. When I work with clients, the first thing that we have to do is get clear on what we’re trying to accomplish and we do that by setting specific goals. Without the right goals, you’re setting yourself up for failure because you’re either working without a specific achievement in mind and, therefore, don’t have anything to keep your efforts focused, or you’re actively working towards the wrong thing, which will derail you pretty quickly. Now, identifying what exactly you should be striving for is an issue in and of itself, which I won’t cover in this video. If you need help getting clear on where you should be headed, please shoot me a message and I’ll see if I can help. If you already know exactly what you want, however, then this technique will help you structure your goals so that you can most successfully move forward towards to achieving them. SMART goals help ensure you have clarity on what exactly you’re trying to accomplish so that you can develop an action plan to get there. 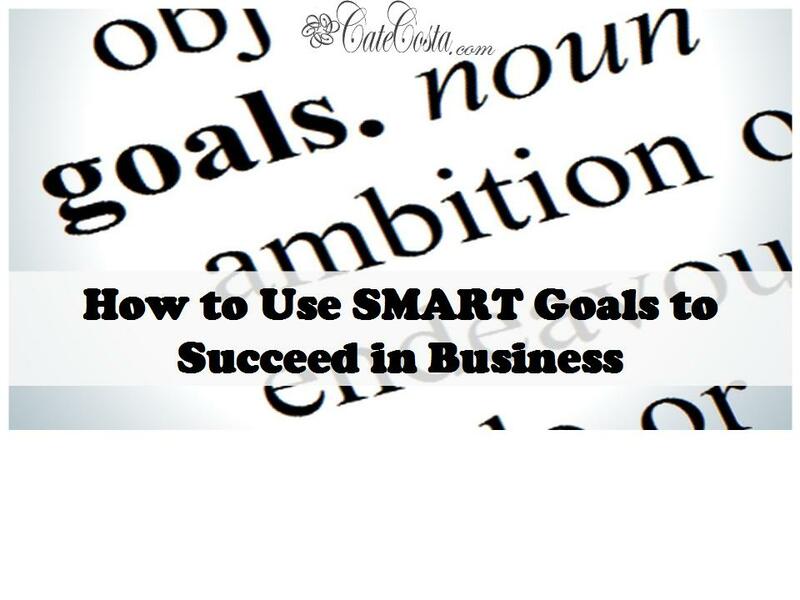 SMART stands for Specific, Measurable, Attainable, Realistic, and Time-Bound and every single goal you set in your business, or in your life, really, should be structured to meet all those criteria. Specific means that you’re very clear on what you’re trying to accomplish. You’re not after revenue growth – you’re after 6% revenue growth over the same period last year in X product line. Measurable means that you can track it – you’re not after something fuzzy like improved word of mouth marketing, you’re after a 30% increase in referrals. Attainable means that you have the capabilities necessary to accomplish the goal so, if you are a social media expert, your goal should not be to bring in 10 new web design clients because you don’t know how to design websites. Realistic is often confused with Attainable, but it is slightly different. While Attainable is about what you are physically or intellectually or technically capable of, Realistic is about what can reasonably be expected given everything else that’s on your plate and the other pulls on your time and resources. So, for example, it may be an Attainable goal to say you will bring in 5 new consulting clients each month because you have the knowledge of how to implement the proper marketing and sales strategy to make that happen. That goal may not be Realistic, however, if you’ve also said you will cut back your hours by 20% to spend more time with your family, you have 3 2 week long vacations coming up over the next 6 months, you’re going back to school full time, and you’re renovating your home. Finally, Time-Bound means you have to put deadlines on everything. A goal does you no good if you’re not expected to accomplish it by a certain time because you can just keep pushing it off. So, a poorly structured goal for a business may be to increase revenues. A SMART goal for a business would be to increase revenue in product line X by 10% over the same quarter of the previous year by Q2 2016. That makes it much clearer what exactly you’re working towards so you can determine what you’ll need to do to get there and be able to measure your progress towards the goal and your success or failure. That’s how you build a successful business. If you’re an aspiring entrepreneur, the best thing you can do for yourself is to just get started. Pick up my business planning ebook here to be guided through the whole business planning process for less than $5. More of a video person than a text person? Click here to try my ecourses instead. Cate: Have you read the works by Dr. Edwin A. Locke? He is a pioneer in the goal setting field and organizational leadership. I’m sitting down tonight and figuring out what all my goals are using this “SMART” formatting. It’s been a long time coming. I’ve figured out and written down my goals tons of times, but they’ve always been vague goals. “I want to increase my income.” “I want to be financially independent.” It’s pretty much impossible to attain goals as vague as that!